Hi everyone and welcome to the Books Between Podcast! I believe in empowering children by helping them discover who they are as readers. My goal is to help you connect kids between 8-12 with fabulous reading experiences and share inspiring conversations with the authors and educators who make that magic happen. I’m your host, Corrina Allen - a mom of two, a 5th grade teacher, and thinking about how much I LOVE our public libraries and how much they are needed. My daughters and I just launched our summer Library Crawl where we try to hit as many public libraries in the area as can and explore their unique services and collections and just get to know them. Libraries are the heart of our communities. Please support them. This is Episode #55 and oday I want to chat with you about being a book witch, and then I’ll share a conversation with Melissa Sarno, author of Just Under the Clouds! I have three super quick announcements for you! First is a Middle Grade at Heart Book Club update. The August pick is Where the Watermelons Grow, the September pick is The House That Lou Built and in October we will be reading Three Rules of Everyday Magic. And all of those authors are scheduled to come on the show - so stay tuned for that! And announcement #2 - don’t forget that Monday nights are the #MGBookChat Twitter chats with upcoming topics like #ownvoices, the importance of refugee stories, and books that battle mental health stigmas. So set a reminder for Mondays at 9pm EST and check out #MGBookChat on Twitter for conversations and collaboration between educators, librarians, and authors. And - finally, announcement #3. This is something that has been semi-secretly in the works for a few months now, but I am so happy to make it official. NerdCamp Central New York is ON for next summer - August 6, 2019! So - if you want to experience some of that NerdCamp magic and you’re able to make it to Syracuse, NY - save the date! And you can follow @NerdCampCNY on Twitter for more updates. And you can go ahead and replace that W with a B if you’d like. So - I had a topic planned for today. I had an outline, things were coming together, and then I saw a post. And then some tweets. From several people, including Donalyn Miller, who were attending a recent Scholastic Reading Summit. It was it from a presentation by Annie Ward - or at least referencing her work From Striving to Thriving: How to Grow Capable, Confident Readers. And it was one slide showing ways that educators and parents can be what she called “Book Wardens”. And well, it struck me so forcefully. And made me think of all those times as a teacher and as a parent, I have been that Book Witch. I am recovering - but yeah…. that was me. So I scrapped my other topic and that’s what I want to talk to you about today. First - ways we might not even realize that we’re being book snobs and inadvertently turning kids off to reading - both from Annie’s presentation and from my own mistakes. And then some thoughts on ways we can do better. Although to be up front with you - my understanding of this is evolving. Starting with the first bullet on that slide. 1. Confining kids to “just right” books - gulp. That is a phrase I have used ever since... I don’t know when! A have a big lesson on choosing “just right” or “good fit” books complete with a whole array of shoes I bring in to demonstrate! But now I am wondering… who SETS the criteria for “right”? Is it.. Level? Genre? Format? Perceived complexity? Something I’ve started doing is turning these questions back on myself. Okay Corrina, what’s a “just right” book for you? Well -it depends! What am I in the mood for? What do I want to learn? What are my friends all reading that looks amazing and I want IN on THAT conversation! When I think about it that way, it’s not really about picking a book off the shelf and reading the first page and counting the errors on my fingers. Adults don’t do that! And - we are definitely NOT picking from the bin labeled Level Z or only reading within our lexile level. So why are we asking kids to do that? What DO we do? We weigh all those factors, gather some options, and try them out. If it’s too hard, well…. then…. I’m just going to put The Iliad off to the side for now. I think we need to trust kids more. And be more open about how you actually go about choosing books. And maybe I don’t totally drop the phrase “just right” but shift it to be child-centered and NOT mean “just right” from MY point of view. So - that last one? About the fan fiction? Was me - a few years ago. But then, I discovered that Angie Thomas (you know - author of New York Times Bestselling, multiple award-winning The Hate U Give) got her start writing fanfiction for her favorite soap opera. And suddenly I thought, maybe I’m being kind of a witch about this. And then, I discovered Star Wars fan fiction and I was hooked. I think I spent about a week just immersed in alternative Star Wars universes. So go ahead - come at me about the fan fiction! 3. Look askance at funny, edgy, or “forbidden” topics. So, confession time. Way back when I was just getting starting as a teacher and starting to build my classroom library, I would ONLY purchase what I, the book witch, deemed as high quality literature. Captain Underpants? Comics? Joke books? Diary of a Wimpy Kid? Uh...no. And oh do I owe those kids an apology. I was flat out wrong. And clearly not remembering all the Garfield and Calvin & Hobbes books that I devoured as a young kid. I’m happy to say our class is filled with Dav Pilkey books and all kids of funny, light-hearted books. Because, wow - don’t we need that now? And as far as edgy or “forbidden” topics - that has always rubbed me the wrong way. Edgy according to who? I’ve seen adults roll their eyes when a 10 year old picked a book about the WWE. I’ve seen adults try to ban books with characters who are dealing with substance abuse. And I’ve seen adults pluck books with gay characters out of their kids hands. Who are we to tell kids that their family, their life, their experiences are “too edgy” and not allowed. 4. Frowning upon rereading. Yup - this is another one I have done regularly. And I think it comes from a well-intentioned place. When you know how many amazing books are out there, you want kids to experience that. And I think for me, I have the bias that I am not typically a HUGE rereader. Aside from a few books that I might reread for school or book club (like Home of the Brave, or Wonder), I find it so hard to resist the siren call of my TBR pile. But last year, instead of giving side-eye to those kids rereading Dork Diaries or Smile for the 3rd or 4th (or 12th!) time - instead, I tried to act excited and say, “Wow - what do you love so much about that book? What are you noticing now that you never noticed the first time you read it?” And the reframing has helped me recognize more value in rereading. And those conversations help me understand my readers better and offer them similar titles they might enjoy to expand their reading palate. 5. Imposing Accountability Measures for Reading. I’ll admit - I had to think about this one for a minute. But I think what this is getting at is when ‘points programs” like AR (Accelerated Reader) are used to confine student reading in an attempt to make sure there is tangible proof of reading. Accountability measures might include parent sign-offs on a reading log or requiring a summary each night. That imposition on reading. Instead - the best “accountability” is a culture of reading where kids want to talk about what they are reading. And your tangible proof are conferences and conversations and observations. 6. Treating some books like “dessert”. And only allowing kids to read them after they’ve read something more suitable. Usually when I see this - those “dessert” books are graphic novels, or Minecraft books. Now - there are times when I will say, “Let’s take some some time to read our Book Club novels. And if you finish your section for the day, read whatever you want.” But always treating SOME TYPES of books like just fluff - is being a book witch. So those were the main points from Annie Ward. But I’ll add one more. 7. Not letting kids take the books home. I used to treat MY books like they were GOLD. And I would let kids read them in class but then not let them out of my sight. I lost fewer books - but I also lost readers. Now - they go home with them. Usually they come back, but if not - I just hope that book meant so much to that child that they couldn’t bare to part with it. Let kids take the lead in what “just right” reading means for them - including their mood and what they are interested in, the format, the social connections they want to form around that reading - and not just a level. Don’t be a book snob! Openly embrace and book talk all genres and formats and expand your horizons. If a child is rereading a book - ask them about it! Or ask them to book talk it to the class! Instead of cumbersome attempts at reading accountability, instead - watch your kids, have conversations about the books, confer with them and have them read to you. Let kids take books home. And be gracious when they get lost or damaged. And finally - trust the kids and trust the books. If you want to know more about Annie Ward’s work with co-author Stephanie Harvey, I highly recommend you pick up a copy of From Striving to Thriving: How to Grow Capable, Confident Readers. And as always, we are learning together and helping each other out, so please share your thoughts about overcoming being a book witch. 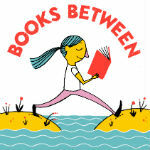 You can tag me on Twitter, Instagram, and now Facebook - our handle is @books_between or email me at booksbetween@gmail.com and I’d love to share your ideas. Joining me this month for our Middle Grade at Heart interview with Melissa Sarno is author Julie Artz. We got a chance to sit down together last month to chat about Just Under the Clouds. CA: For our listeners who haven’t yet read Just Under the Clouds what is this story about? CA: One of my favorite parts of the book is when Cora goes to her remedial math class and her new teacher gives her some advice about solving algebra problems. She says: “I’ll give you a hint. It’s always easiest to start from the end. Start backward.” I’m wondering - when if your own life have you found it easier to start at the end? JA: I loved the friendship between Cora and Sabina. They both have experienced intense loneliness due to an unconventional lifestyle, but the moment when they commit to their friendship--even though they may end up apart--was really touching. How did you come up with the idea for this complex and lovely friendship? JA: Adare is such a vivid character despite being mostly non-verbal. What research went into creating her character? **BONUS SPOILER SECTION: Melissa and Julie and I discuss the ending of the novel, and if you’d like to hear that conversation, I moved that part of the recording to after the end credits of today’s episode at the 37:50 mark. JA: I loved the tree book and all that it represented for Cora. How much time did you spend researching trees for the story, or has that always been an interest of yours? JA: What types of books did you love when you were Cora’s age?